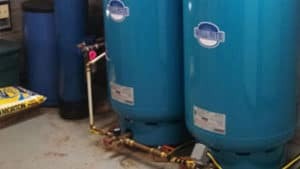 Water Tank Installation Bedford Hills NY | Water Tank Service Bedford Hills | Water Tank Replacement Bedford Hills	| Churyk Company, Inc.
A water tank is an integral part of most residential water systems. It is the part of the well system that stores and delivers the water to the home. The tank uses air pressure in a chamber or diagram to push the water to where it is needed. Often, low water pressure issues are related to your tank. Older tanks are unable to maintain proper pressure. They may have ruptured bladders, be filled with sediment or rust. Our trained technicians can diagnose tank problems and recommend upgrades if needed. We install Well Rite tanks manufactured in Randolph, Massachusetts USA. They are the premier water tank on the market having epoxy coat paint, stainless steel connections and NSF approvals. We also install storage tank systems. These are tanks that hold larger quantities of unpressurized water. The tanks get filled by your well at a slower rate and allow long periods of rest for the well and pump system. The water in the tanks is then distributed by a booster pump at high pressure. This allows you to use the full yield of the well. Storage tanks are a good option for low producing wells. If your well cannot keep up with your demand or you have low pressure, we can offer the optimum size tank to meet your household usage. This includes multi-tank systems and storage/booster systems, so you’ll never run out again. All our tanks are guaranteed by the manufacturers for five (5) years and covered by Churyk Company’s One (1) year guarantee on installation.